You can listen to all songs in the playlist at the end of the review. In view of what Stephen Devassy has in offer over the rest of KQ’s soundtrack, Azhakolum Maariville is the most ordinary song with its very heard-before kind of tune. Even the arrangement, despite some neat touches from the composer, bears a mild repeat feel. The singing by Haricharan and Saptaparna is brilliant though. Equally brilliant is Sooraj Santhosh who replaces Haricharan in the alternate version titled Iniyum Nin. Where Stephen really gets it going is with Ithu Vare Njaan – Vijay Prakash’s impeccable soaring vocals resonating over a sprawling strings-dominated palette. The violin solos are just lovely! In Chundathe the composer manages to quite neatly emulate the Malayalam cinematic qawwali sound that hasn’t been heard for quite some time. The raga (kaapi or patdip?) arrangement combo sort of reminds one of Raveendran Master’s Tu Badi Maasha Allah in places. Not to take any credit off Stephen though, the use of harmonium and sarangi is particularly fabulous. And to top it there is Shankar Mahadevan acing the vocals as he usually does. Marking Shaktisree Gopalan’s Malayalam debut alongside Benny Dayal is Chendhalire. And they sound superbly exotic while in the backdrop is an intriguing mix of genres. Finally there is Kanni Vasantham where the composer nails the yesteryear disco sound, once again showing his adeptness at the use of instruments. And Vijay Yesudas does a super energetic job behind mic though seemingly struggling at times over the tongue twister level rendition. 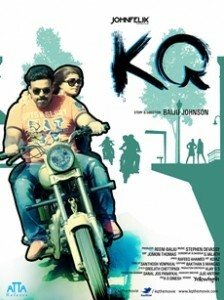 After a lackluster film debut(Hariharan Pillai Happy Aanu) 10 years back, Stephen Devassy makes a super comeback in KQ. A soundtrack that showcases the composer’s arrangement acumen pretty well.